The main function of a front door is to let people come and go while keeping the interiors of a home secured. It is also the first thing that a visitor notices when he comes visiting your home. Not only this, it sets the mood and style of a home, elegantly and in a friendly manner welcoming the visitors and guests. Here are some front door renovation ideas when it comes to home improvement in Perth, that can make it the interest arresting centrepiece it should be. A study done by a reputable manufacturer of doors found that changing a front door can enhance the value of a home. In this study, it was found that replacing an entryway with a modern variety upped the value of a home by more than ten times the cost of a new door. 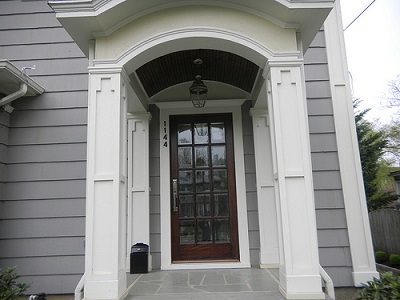 Apart from this, a properly installed new door increases the curb appeal of your entryway. It is however recommended that you opt to make bigger the entryways by installing doors that have windows on either side or above. •	Having the door painted in different colours. •	Adding a uniquely designed house number above or to one side of the door. •	Hanging a wreath in the centre. •	Installing long shutters on either side of the door. •	Adding a historic, playful or decorative specialty door knocker. From poodle- to chilli pepper -styled knockers, there is a wide range of door knockers online that can be opted for. These all will put a smile to your face when come back at the end of a long and tiring day. The addition of planters with an assortment of different textured and coloured flowers and plants on either side of an entryway is one of the smartest ways to enhance the physical appearance of a front door. Though a front door is not a technologically advanced section of your home, the inclusion of a video or audio door responding system, a phone and doorbell combo, and the likes systems can make all the difference. If there is insufficient natural light coming in, then it is recommended to have additional lights installed at your front door. And if you already have the lights installed, consider replacing them with updated version so to modernize the look of your entryway. If for example you have a porch, installing a hanging lighting fixture to cast a welcoming pool of light on the front door can make all the difference. While budgets and styles are major considerations when it comes to updating the front door, any improvement that can be made to a most prominent feature in a home is always a worth investment in both money and time. While at it, it is good to note that the front door is the first thing that most people notice when they come to your place. As such, it is important that it makes a lasting impression on all those who come knocking!